During the hiatus of my blogging I did make a small attempt at bridging the divide by a small facebook group that invited both sides in to discuss issues and seek some middle ground. Sad to day, that effort seems to have fallen by the wayside as it seems there is little interest in meeting towards the middle currently. The United States of America is a precious gift bestowed upon us. No, it’s not perfect, but it is our home and we should appreciate this gift by pulling together to save it from falling apart. 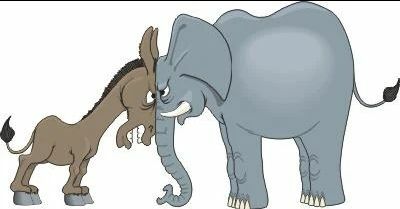 I’ve been involved in those types of ‘bi-partisan’ discussions as well and left disappointed. It is very difficult to be dispassionate about your core beliefs – especially when the person you’re speaking with has a worldview that is the polar opposite of your own. It begins to feel like there is no common ground – nothing on which you can agree. In the end you either suppress your own thoughts on what the other point of view is or you ‘get into it’. Either way you end up walking away in frustration. From my view, what you describe is what has led us to where we are today. One side, usually the left digs in their heels and is unyielding while the right was trying to accommodate at least some. The so-called center just kept moving farther and farther left over the years, giving rise to the far right factions who have now dug in their heels with both sides now being unyielding. That’s why I say as they fight each other for partisan power, the country continues to fall apart. It’s a real mess and I don’t know how will end or if it will ever end. We can start by not electing corrupt reality TV stars to the highest office in the land. We have Fox News skewing and shaping the most important news of the day to fit a Trump agenda. Thank God for “mainstream media “. Without it we would be left with pure propaganda. Conservatives should demand and expect truthful accountability from their news sources. Instead we have the Hannitys and Ingrahams stoking fear and hate. Truth should not be feared. And brevity can be your friend. If nothing else, you give a perfect example of why we have such deep division in the first place. All must be your way or not at all! And as long as you demand everything your way only, those divisions will only grow deeper. As far as I am concerned, you can keep your tyrannical desires, I prefer freedom. I called for responsible journalism and qualified presidential candidates. You call my comments tyrannical. I suppose we all have our concepts about freedom. I wonder if you were to witness a White Democrat knocking a MAGA hat off of a Black Guys head after confronting him in Starbucks if you would sit quietly or defend the Black guy’s freedom to support and hold what views he chooses.